I love wash days around here. It’s so colorful. Several of these skeins have been sitting around, waiting for their turn in the bath. I have a new strategy for setting the twist. I squeeze the water out of the skein with my hands but I don’t spin the water out nor roll it between towels. 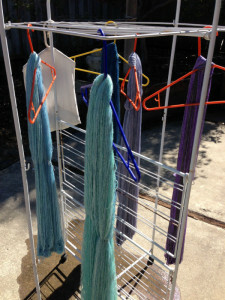 I just put it on the hanger and let the weight of the water to weigh the skein. I have found that this does a great job of removing any kinks without losing the liveliness/bounce of the yarn since the weight (water) is removed as the skein dries. Of course, this works better during the summer than it does in winter. However, I have rigged up a second shower rod in the guest bath centered over the tub and a few inches from the ceiling. This allows items to drip dry into the tub without messy water everywhere. Rainbow Farms Pygora: Loch Ness (50/50 Pygora/Cormo), Seattle (60/35/5 Pygora, Merino, Silk). 4.23 oz, 512 yds, 2 ply. Spun and plied on Tina II. 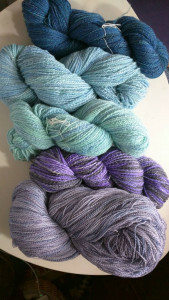 BFL (purchased at Whidbey Island Spin In, can’t find label): one skein more blue, one more minty green. 462 yds (6.03 oz) and 522 yds (6.32 oz) respectively. Spun on Matchless, plied on mSpinner. The Wacky Windmill: Gloomy Day, Superwash Wool (feels like merino). 4.26 oz, 270 yds. Spun and plied on Matchless. Fibermorphosis: Superwash Merino. 11.11 oz, 1,456 yds, 3 ply. Spun on Matchless, plied on mSpinner. Next Next post: Baby Surprise Jacket!